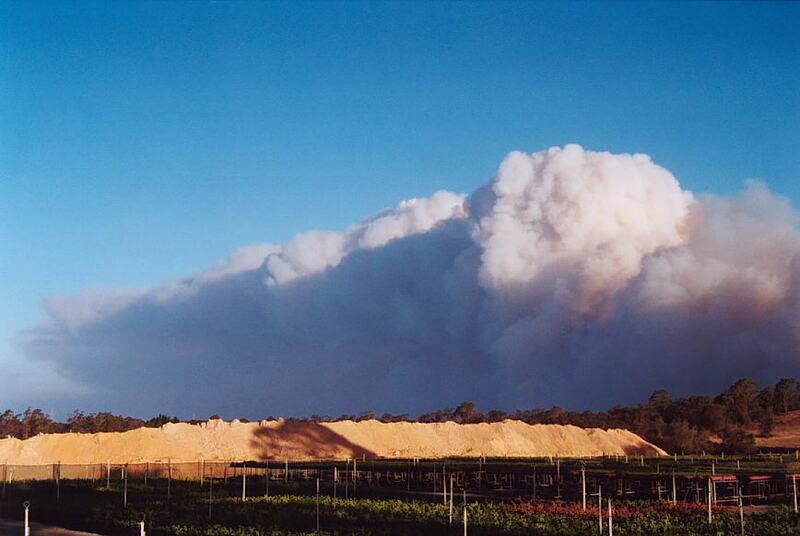 On 4th and 5th December 2002 an outbreak of firestorms devastated several regions of eastern New South Wales, something that has become too common over the past few months. 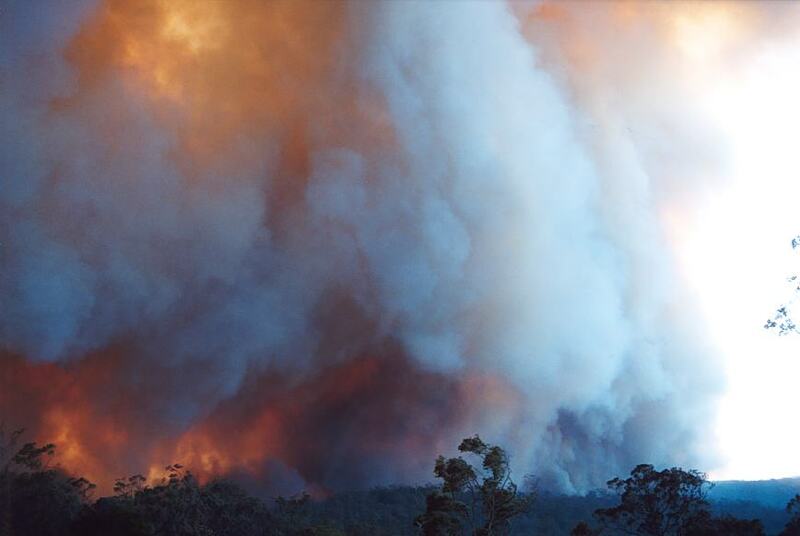 Fires quickly gained organisation and structure and rapidly burnt through forests and also properties including some suburbs of Sydney and west parts of Nowra, north of Sydney. 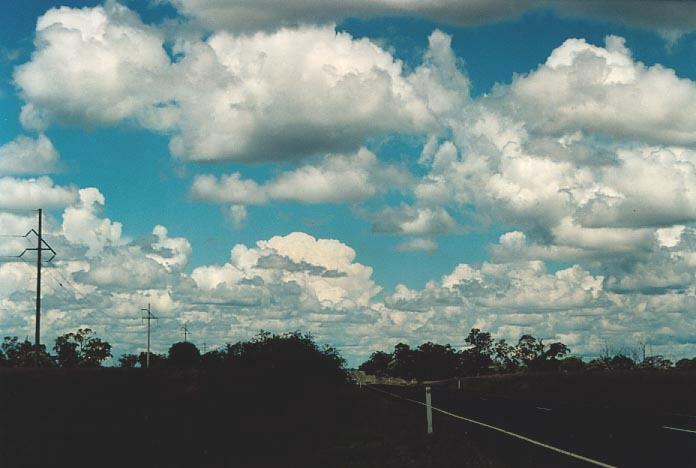 Whilst on the Thunder Down Under, the 20th November 2000 set the contrast between floods at Charleville to severe storms 300km further east near Roma in south east Queensland. Very large congestus developed in the region with severe storms developing during the early to mid afternoon period. 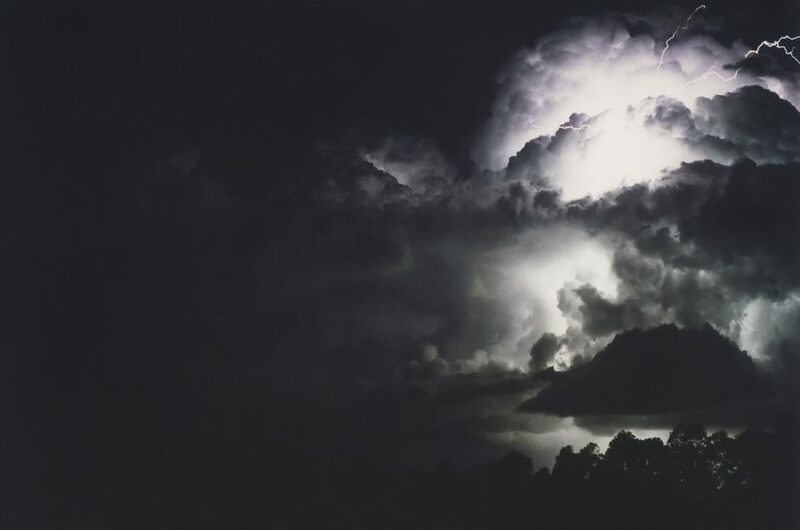 These storms developed rapidly in a deep atmosphere but were not long lasting. 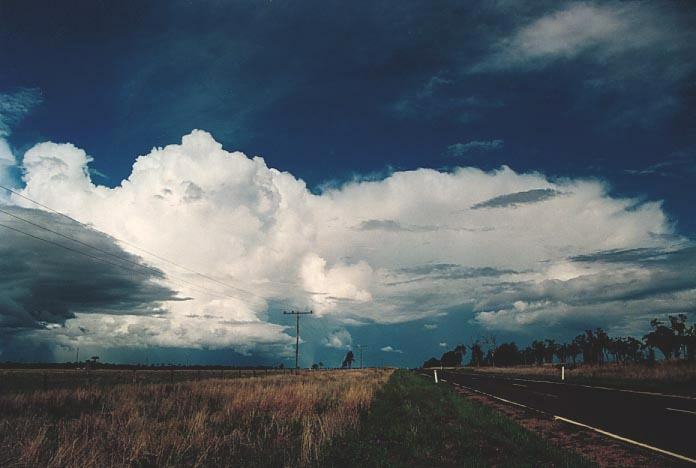 Whilst at Chinchilla, a severe storm complex that had developed to the south nearer St George region approached. The side anvil was strong with powerful updraughts. As we chased nearby, we were treated to awesome structure. 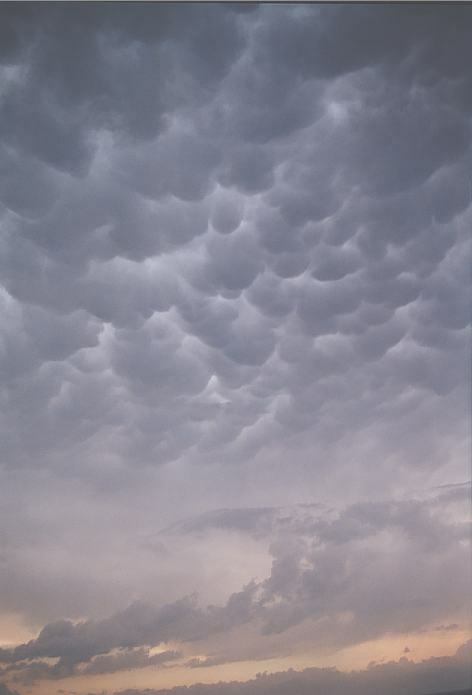 Even a cow-catcher structure had developed probably reacting to increased shear from outflow of decaying storms. Though just like the other storms, the storm collapsed within an hour afterwards. 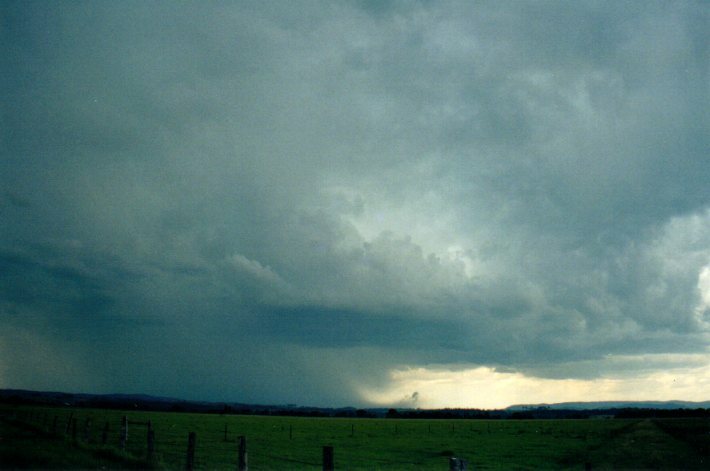 The 29th of September 1996 produced an ideal spring setup and turned into one of the most significant Australian tornadic outbreaks in recent times. An early cloud band with negative tilted trough cleared. 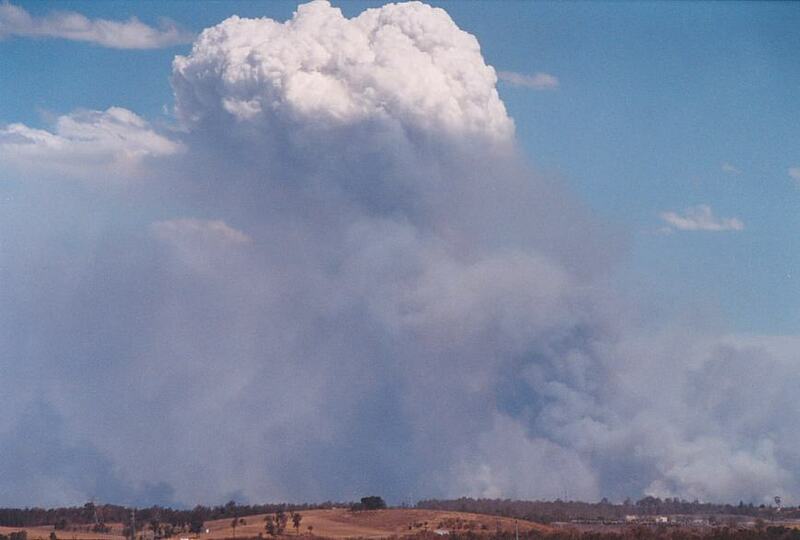 The remainder of central New South Wales was left with unstable air. 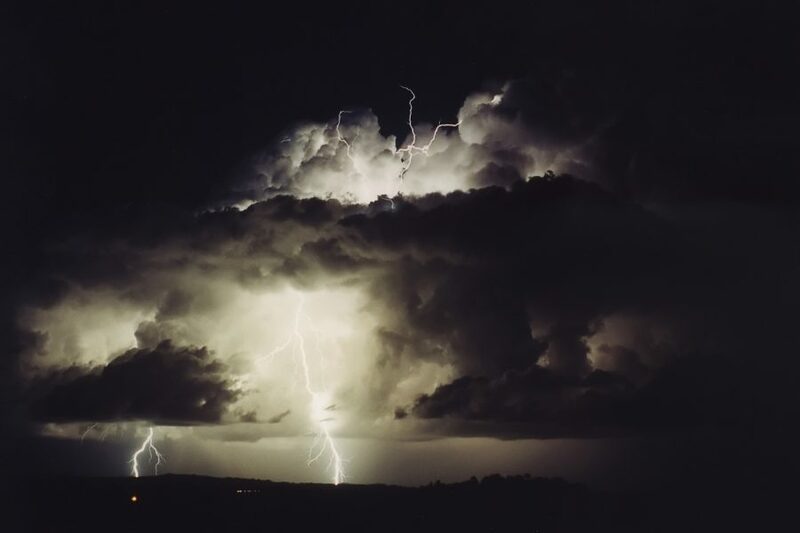 With good wind shear and ideal moisture as well as an upper level trough complex, severe thunderstorms and supercells developed producing a wide region of severe activity. 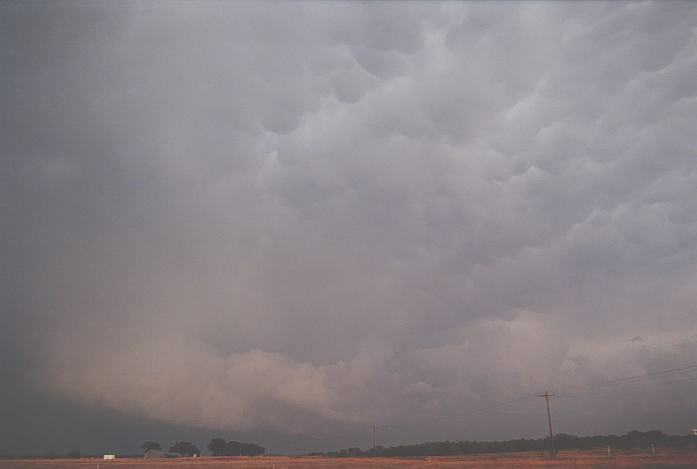 Three tornadoes were reported with F2 damage see Spring 1996 reports. 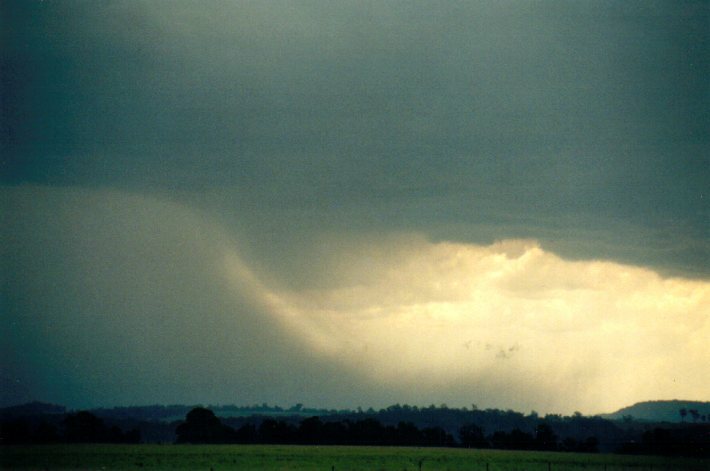 During the late afternoon, Armidale was devastated by a supercell with 8cm hail and winds up to 150km/hr. Giant hail reports on this day were not uncommon. 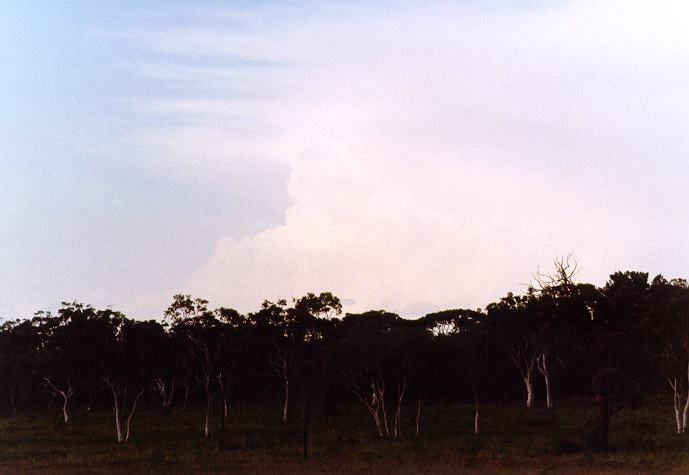 The 10th February 1995 event was an unusual one in that thunderstorms developed over the ranges and seemed to backbuild northwards. 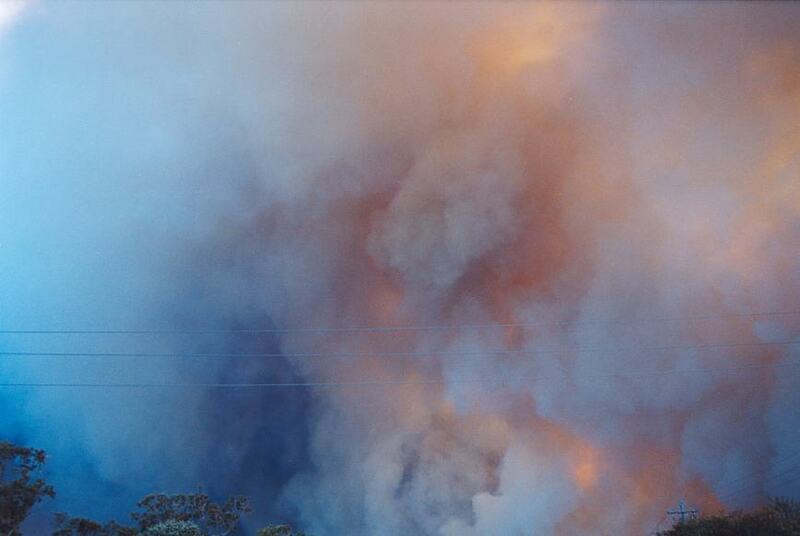 Apparently haildrifts were reported near Lithgow and west of Katoomba from this activity. But it was the evening and night activity that approached from the 'north' that surprisingly gave an excellent lightning show. There were reports of golf ball sized hail in a suburb of the North Shore. 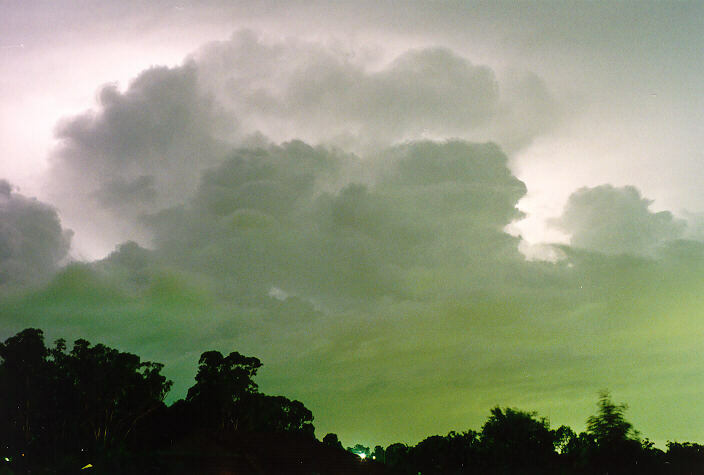 It was exciting to observe storm structure illuminated by the lightning. 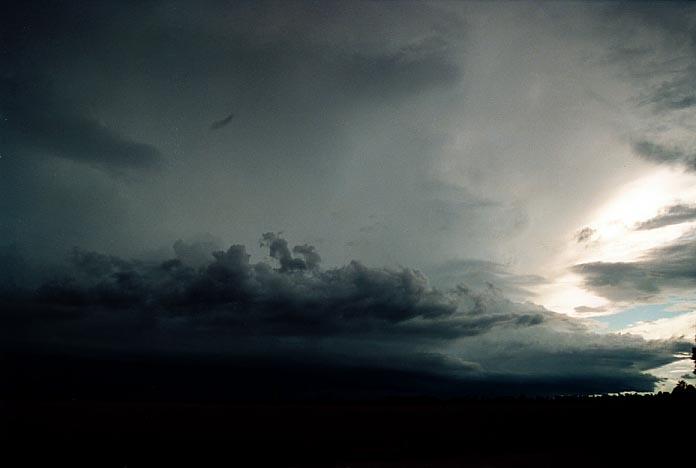 More pictures from the storm chasing trip in the United States 2002, Matthew Piper and Jimmy Deguara were amongst the very few fortunate to intercept this tornadic supercell. 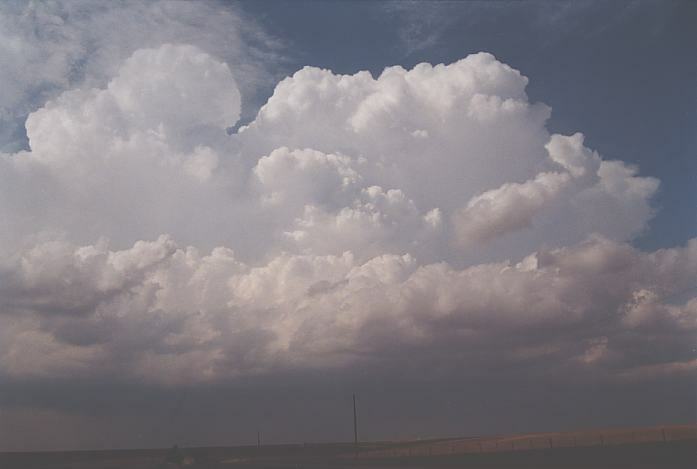 During the mid to late afternoon period, a severe storm complex rapidly developed and moved into Oklahoma from western Texas. This complex failed to live up to its expectations of tornadoes. 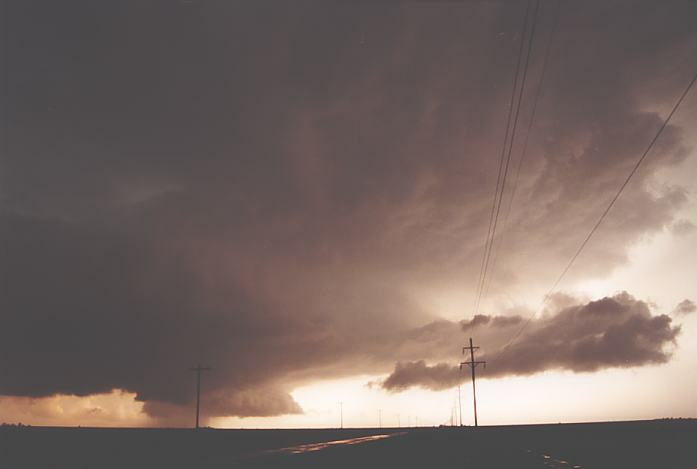 The right-moving HP supercell that followed however quickly developed severe characteristics and rotation. A "cow catcher" also developed on the northern side as the storm developed a bell shaped updraught. With less precipitation and more rain free base region, a wall cloud developed. At about 7:50pm, it produced a multi-vortex tornado; the activity lasting up to a couple of minutes. 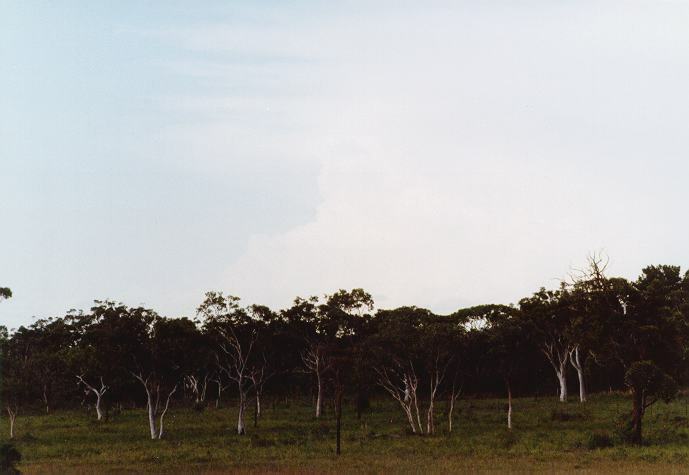 Click here for access to more of the 2002 US photographs. 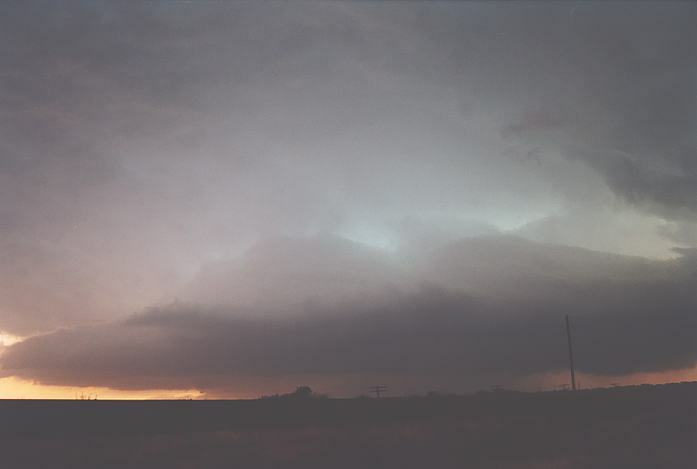 During the recent trip in the United States, Matthew Piper and Jimmy Deguara intercepted a developing supercell in the northwestern Texas panhandle region and then another supercell further west. These developed as an outflow boundary spread further inland toward the dryline. The first supercell developed to the north of Canadian with cloud top heights from strong updraughts apparently reaching 50000ft (~15km). This storm persisted for a few hours with dust whirl activity observed a few times. 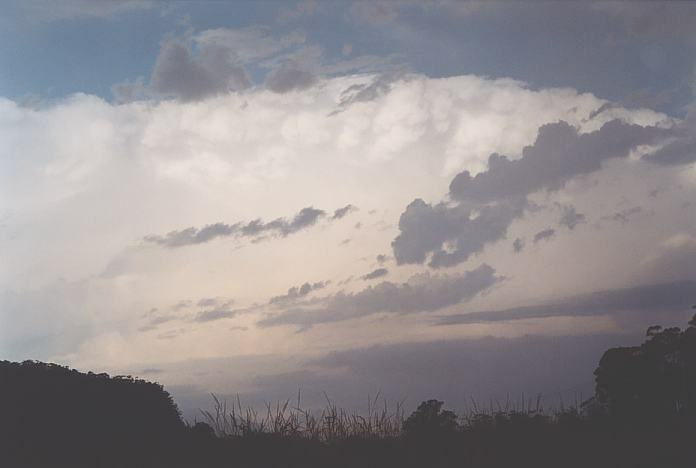 Then an anvil overshadowed the storm from a more powerful supercell complex to the west. First signs of this cell was the impressive anvil. 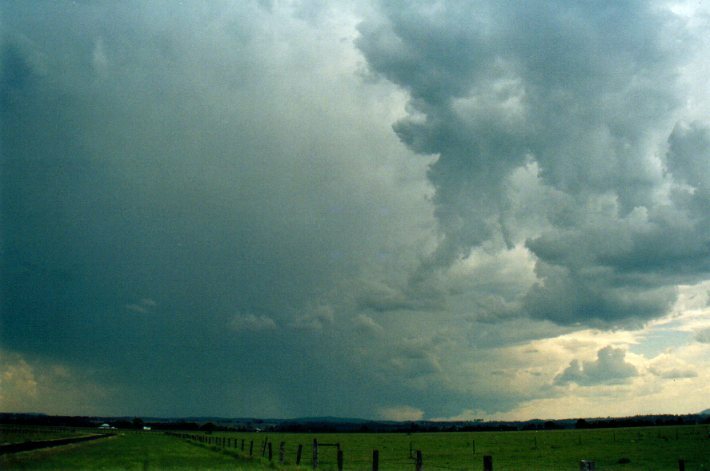 The first storm rapdily collapsed. 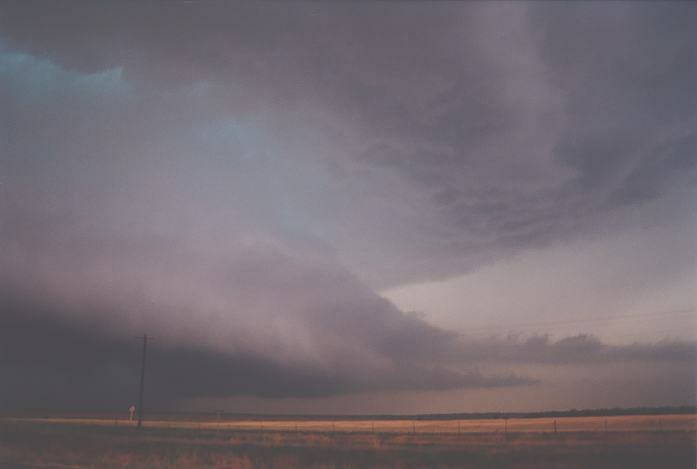 The second supercell complex showed significant inflow features from the northeast and also east rapidly converging within the supercell. This cell or any other development from it gradually moved southeast during the evening and then east during the late night period. It produced a tornado near Borger and periodically reports of hail close to 3 inches were reported within this relatively lower populated area as well as hail drifts. 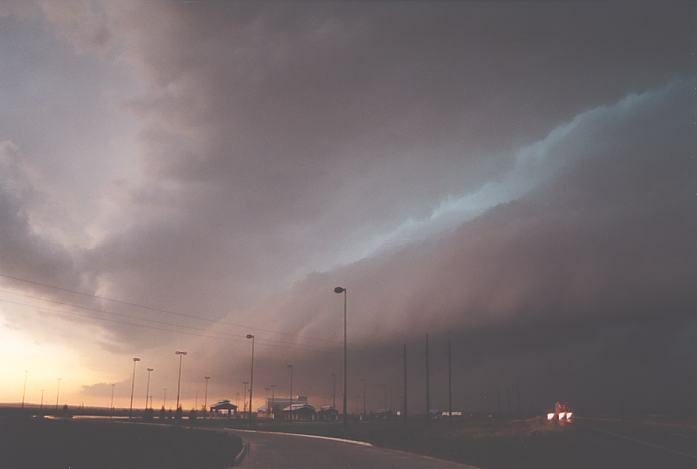 Warnings of "brief but destructive tornadoes" and "hail up to the size of baseballs" were aired as the comma shaped complex slowly approached Canadian. Although the storm had weakened and veered east-northeast by then, it still managed to drop hail up to golf ball size. 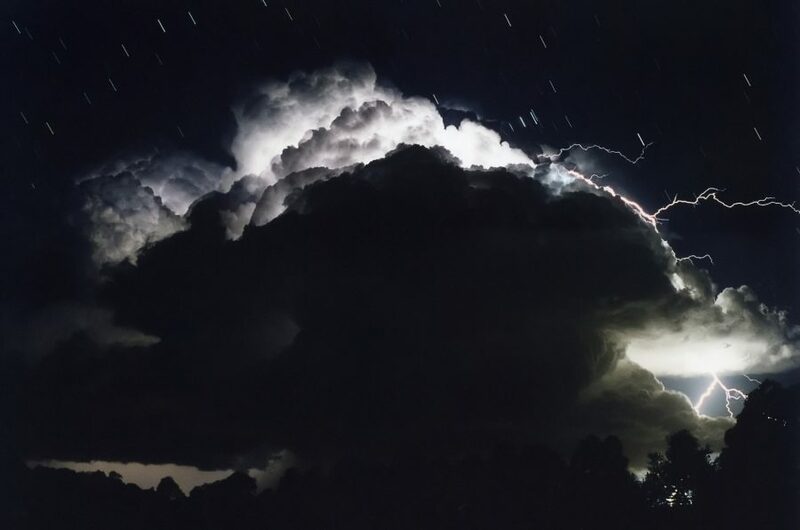 With a cut-off cold pool creating an environment for cyclogenesis over central and northern New South Wales, very warm and humid conditions and a trough in north-eastern New South Wales was a sufficient trigger for thunderstorms. 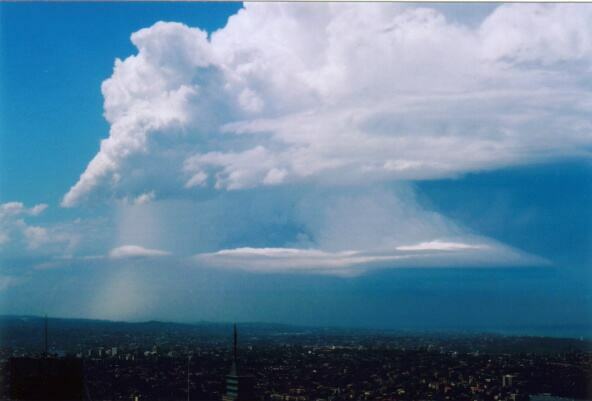 And this was separate from the line of thunderstorms that developed in central New South Wales later. 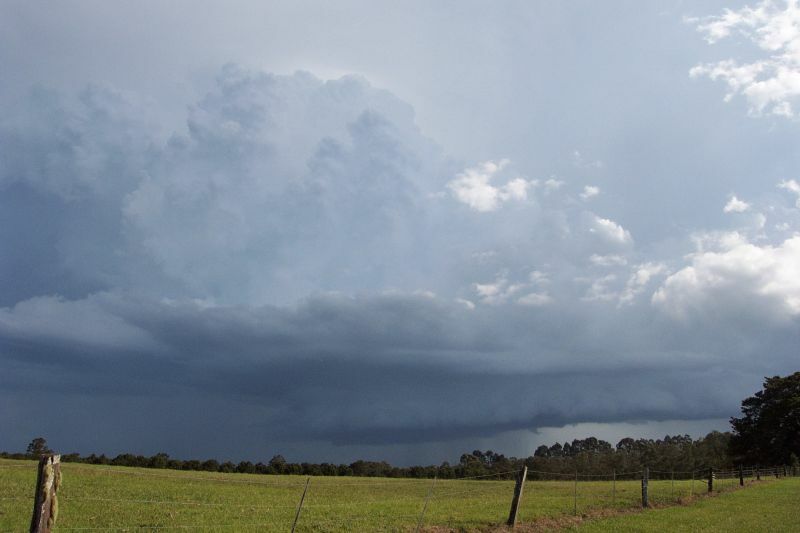 Nevertheless, isolated thunderstorm activity developed and became severe south of Lismore. 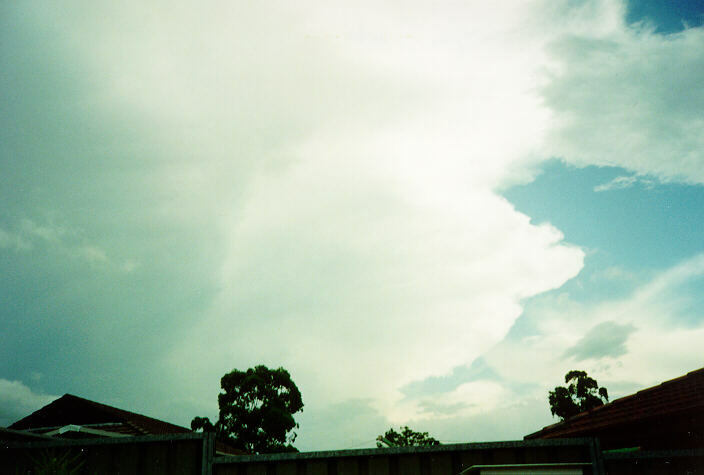 An extensive backsheared anvil developed with progressive crisp updraughts given the steep lapse rates and dry air intrusion aloft. As the storm approached, a probable wall cloud became visible but it seemed the whole system was becoming more oriented into a spectacular linear shelf cloud formation. Lightning was also becoming more frequent as it slowly approached. The left moving nature of the storm and reasonable wind shear in the lower to mid layers meant this storm was probably supercellular. Hail to 3cm was reported. 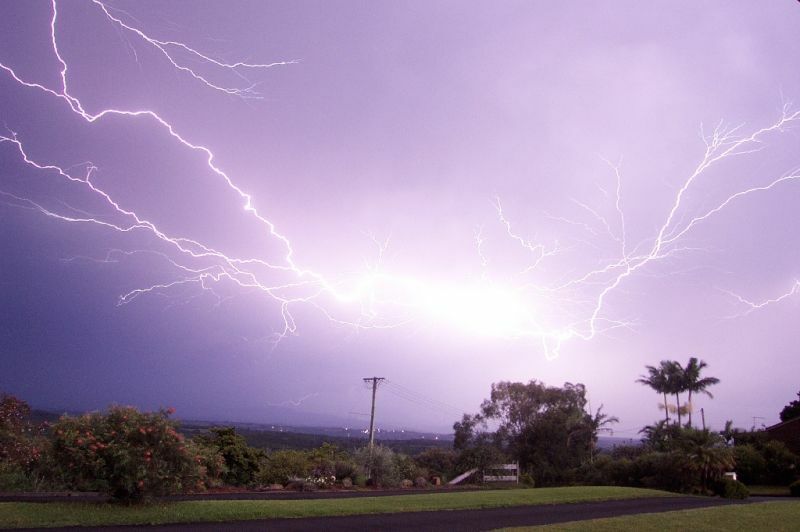 A night lightning display followed from further thunderstorms developing from the west later. 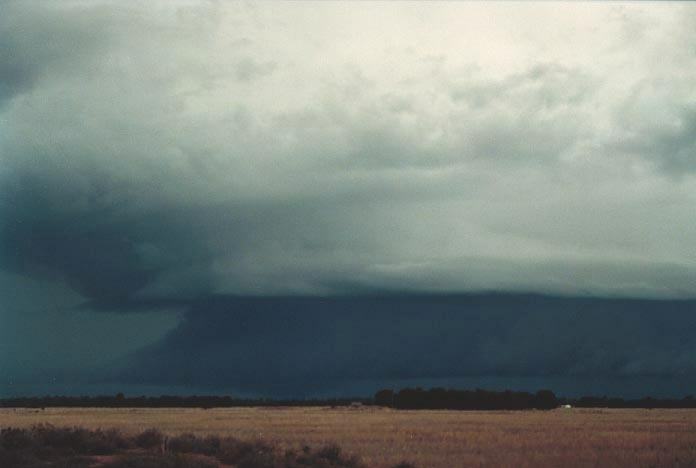 The 8th February 2002 certainly produced some amazing storm structure as well as severe weather. Wind shear was excellent aloft and was sufficient for supercell development. 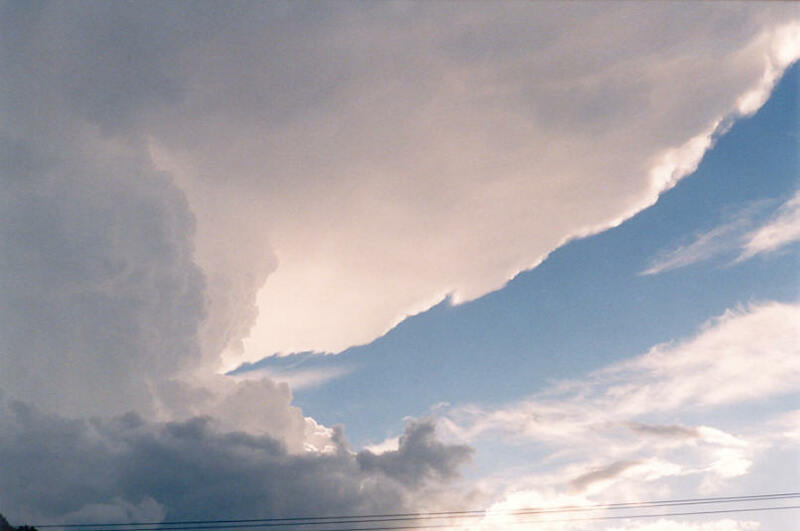 Once storms developed, they developed rapidly and most became supercells. 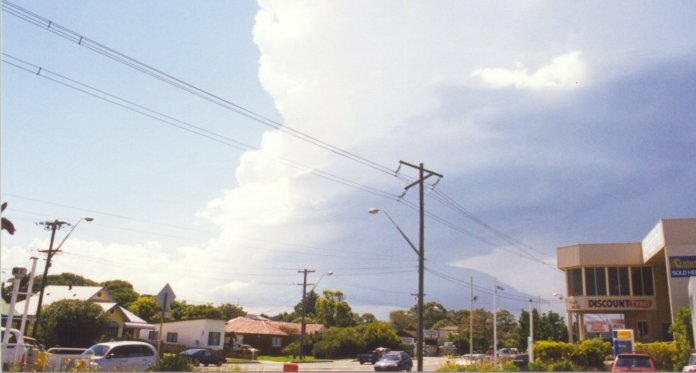 The first storm passed south Gosford and on to Avalon. This certainly displayed more Low Precipitation (LP) structure. 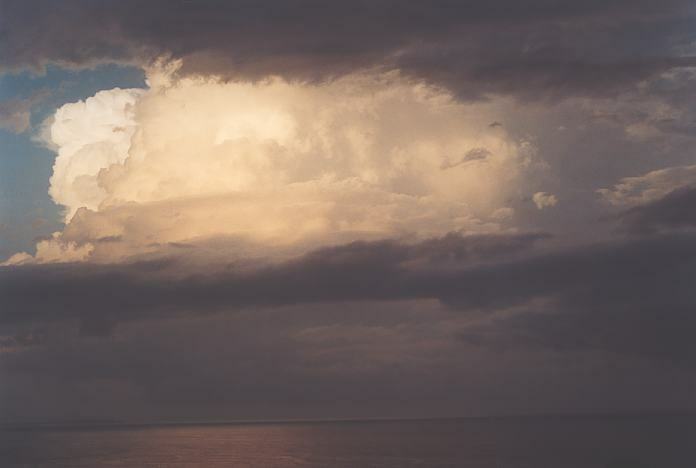 As was the feature of the storms on this day, that dissipated rapidly once off the coast. The second storm to pass through Sydney was equally as spectacular and perhaps developed more into the classic supercell structure. 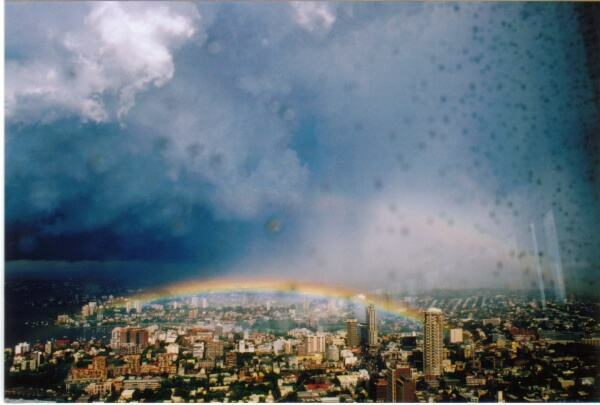 Mario was also able to view both of these events from the Centre Point Tower. 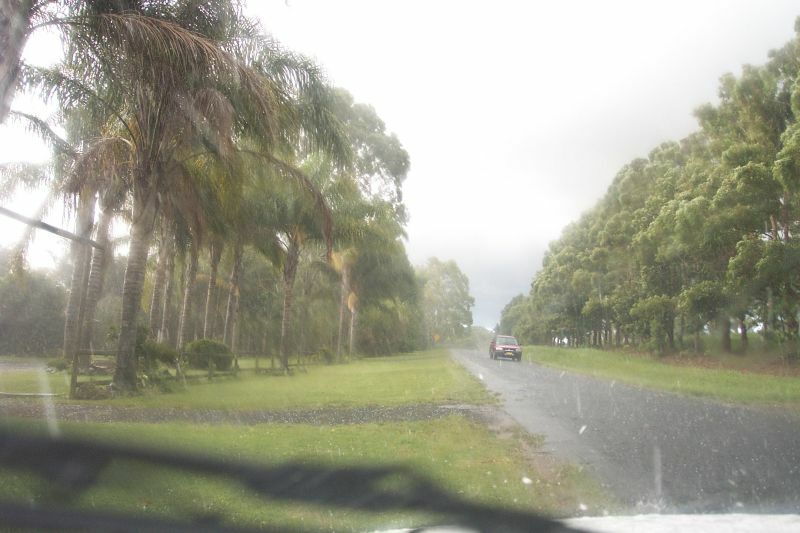 The 30th December on the North Coast was part of a series of storm days with severe weather. Wind shear was good but not exceptional. Severe storms developed in the early afternoon. 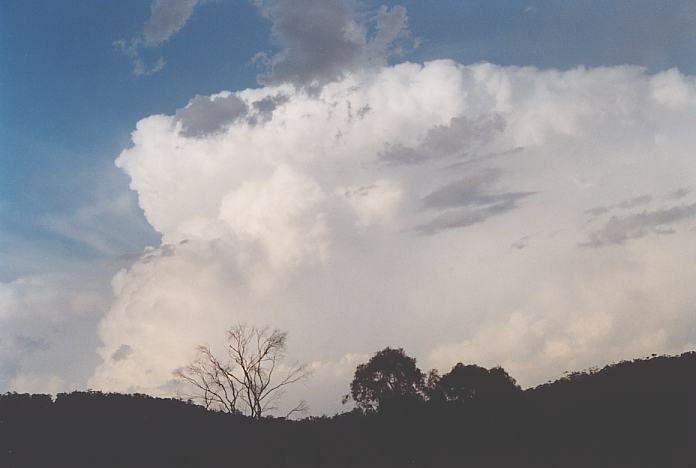 One particular storm developed east of Tenterfield during early afternoon on 30th December 2001. It initially tracked east before strengthening and veering towards the NNE. 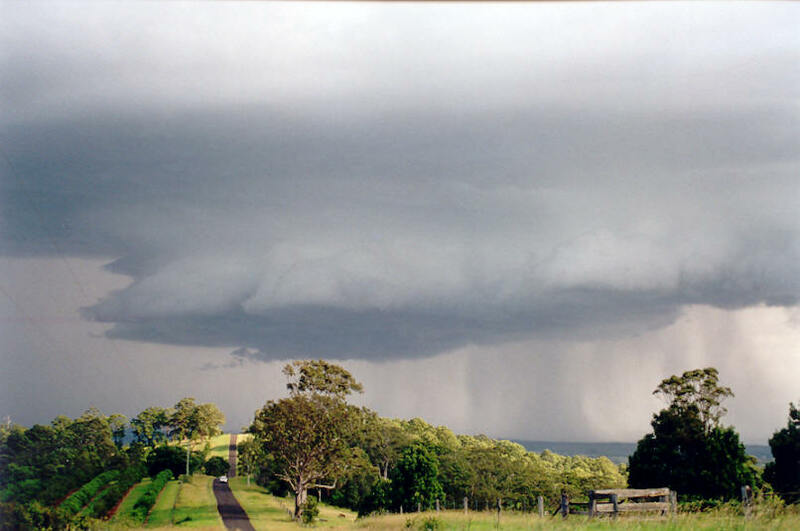 A feature of the storm was the microbursts that developed in cycles on the NE side of the cell - several were observed between Casino and Kyogle. 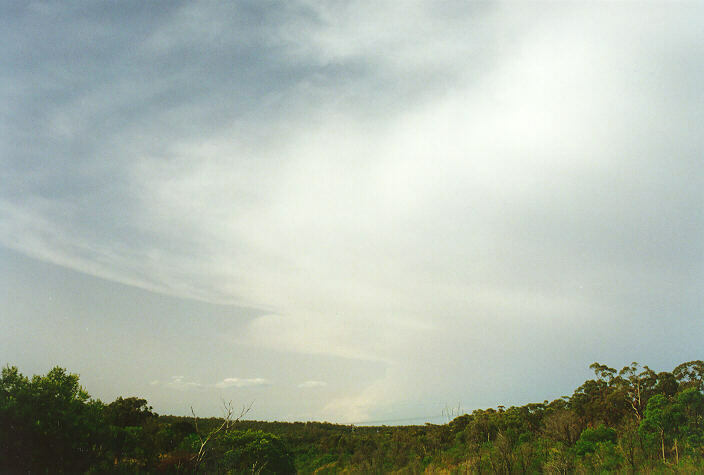 Indicators had this day to produce severe weather with initiation further inland along the ranges along a convergence zone. Although this did happen, it took some time before the storms broke through the upper cap. When they did, storms literally exploded helped along by the favourable upper level wind shear. Hail was reported in many areas and some damage reported in localised areas like Comboyne due to wind and large hail. Some storms will have developed into supercells. A fine day with some cumulus developing then clearing during the afternoon. Temperatures reached about 29 with westerly winds. 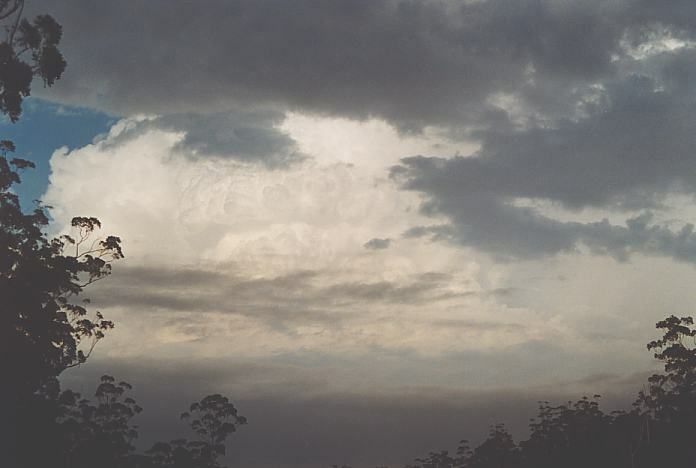 A weak trough clipped the Far North Coast during the evening pushing up some storm cells west of Ballina. The lightning was not frequent but very spectacular ! Congestus persisted near the North Coast and Southern Gold Coast into the morning. Several funnel clouds descended just off Coolangatta during the morning.